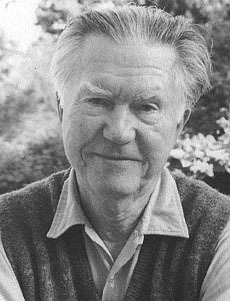 William Stafford was born in Kansas in 1914. He attended the Universities of Kansas and Iowa. He was a conscientious objector during World War II and worked in the alternative service camps. He married Dorothy Hope Frantz in 1944 and raised four children with her. Stafford taught at Lewis and Clark College from 1948 to his retirement in 1980. Traveling Through the Dark, Stafford’s first collection of poems, won the National Book Award in 1963. He was 48 years old. During his career, he wrote prolifically and published over 65 books of poetry and prose. He was the recipient of a Shelley Memorial Award, a Guggenheim Fellowship, and a Western States Lifetime Achievement Award in Poetry. In 1970, he served as the Consultant in Poetry to the Library of Congress (a position now referred to as Poet Laureate). Stafford passed away in 1993.